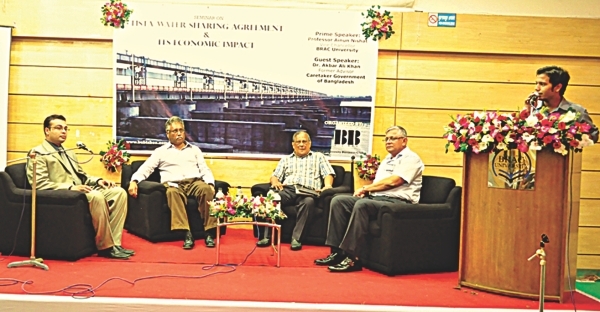 Amidst the looming problems with respect to the sharing of River Teesta, emphasised due to the recently failed negotiations between the governments of the two countries (Bangladesh-India), the Business Club of BRAC University organised a discussion on the 'Teesta Water Sharing Agreement and its Economic Impact' on October 12, focusing on schemes that could help solve the economic hurdles caused due to the improper distribution of the river. “The Teesta issue has been a converging point for politicians, environmentalists and economists; everybody has a say in it,” said Dr Ainun Nishat, currently the Vice-Chancellor of BRAC University. Deemed as a water resource specialist by the International Union for Conservation of Nature and Natural Resources (IUCN), Dr Nishat termed Teesta as a 'notorious' river with varying fluctuations. He emphasised the importance of conducting a proper study on the flow of the river. “It is important to reform the notion that Teesta is not a river of chaos, but a river of peace,” he added. Speaking to the audience, who were mostly students, Dr Nishat explained the role that the river plays during the onset of the dry season in the northern part of the country. “The monsoons retreat early in the northern districts; in order to compensate for the rainfalls brought by the monsoons, the farmers look towards the Teesta River for their cultivation,” he said. However reports suggest that due to the barrage and dams built by India in the upper basin of the river, the flow of the river subsides as it enters Bangladesh and therefore affects crop cultivation. 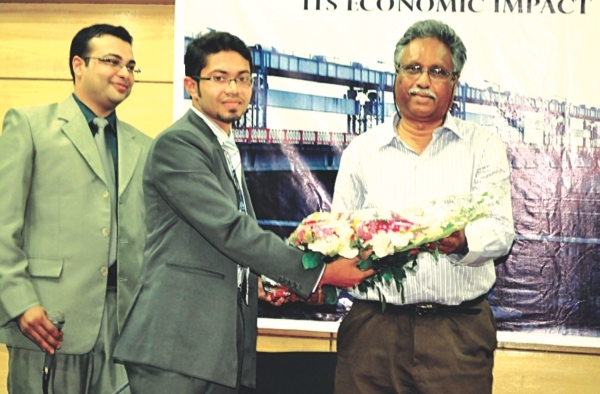 “The Teesta issue is more of a political matter than a technical one,” explained Dr Nishat. Echoing Dr Nishat's sentiments, Dr Akbar Ali Khan, former Advisor to the Caretaker Government of Bangladesh, emphasised the importance of fresh negotiations with Indian officials. He also stressed upon the usage of river-saving techniques, in order to prevent River Teesta from drying. “In my opinion there are three parties sharing the river: Bangladesh, India and the river itself, which needs water for its survival,” explained Dr Khan. He reiterated the fact that the river almost dries out during the lean season. “Signing a water-sharing treaty will not make a difference if the river doesn't survive in the first place,” he said. Dr Khan also talked about the possibility of sharing of electricity by the two countries by building small dams. He explained that the building of smaller dams as opposed to large hydro-electric projects would prevent the disruption of the natural flow of the river. “Since it is more expensive to build smaller dams, both the countries can share the costs and the electricity produced as well,” he said. Furthermore, Dr Khan encouraged negotiations between the two countries on the grounds of basin-wise management of the Teesta River. Replying to the questions on whether Indian officials would agree to the various win-win scenarios suggested and if the Bangladeshi diplomats were skilled enough to get the desired results through negotiations, Dr Nishat replied that it is in the best interest of India to keep her neighbours happy. “Indian officials know that if the areas near the Indian border do not develop then the possibility of illegal migration increases, which is a grave problem for their country, therefore ensuring the development of these areas is important to them,” he explained. To the latter part of the question Dr Nishat said that the final decision of any negotiation is taken by the political leader and not the mere representative. “I don't doubt the ability of the negotiators of the country,” said Dr Nishat, who himself was a member of the government negotiating team on the Teesta issue in 1989. At the end of the discussion however, both speakers were confident that a positive deal on sharing the Teesta River was around the corner. With 'Indo-Bangla' relations having reached great heights in the last couple of years, the Teesta agreement draft which divides the river equally, if accepted by both the parties will not only end a problem that has been lingering since 1952, but will also create a landmark in the Indo-Bangla relationship and perhaps set the platform for a mutual economic-benefit programme.